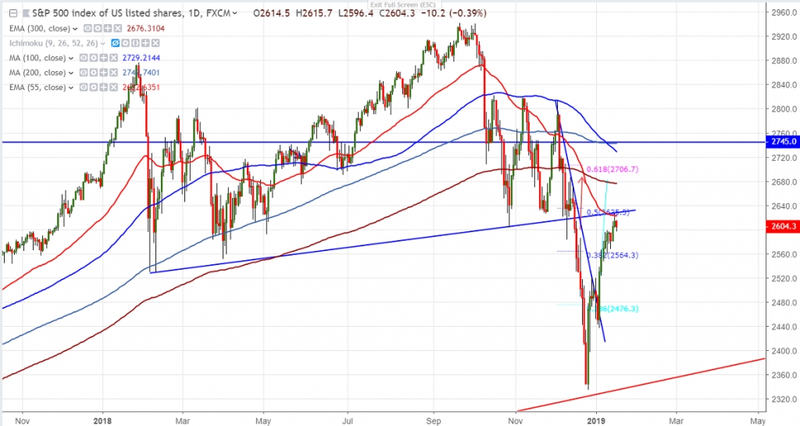 S&P500 has halted its upside movement after 8 days of continuous buying. The index jumped nearly 200 points for the low of 2437. The index hits high of 2623 and is currently trading around 2604.6. Short term trend is bullish as long as support 2515 (20- day MA). Any break below 2515 confirms minor weakness and a dip till 2465/2437/2397. Any further bearish continuation only below 2330.The minor support is 2580. On the higher side near term resistance is around 2625 and any daily close above targets 2678/2725. It is good to buy on dips around 2580 with SL around 2580 for the TP of 2678.